The New York Times had a great article entitled “The All-Natural Taste That Wasn’t,” on the hypocritical fake-ness of what goes into Pinkberry’s so-called “all natural” fro-yo. Seriously, y’all! California should open its eyes to the possibility of Frozen Custard! It’s a little taste of heaven in a cup. In other news, a few weeks ago, I sweetened some plain whole milk yogurt and froze it in an ice cube tray. Four hours later, I blended the yogurt cubes in the blender and enjoyed some smooth frozen yogurt. Yummy – but too much work. Yesterday, my husband tried Pinkberry for the first time. Later that night, he brought me. Bitter. Yogurt-y. Low-cal. Well, one out of three ain’t bad! A good excuse to have chocolate chips… Check that off the list! 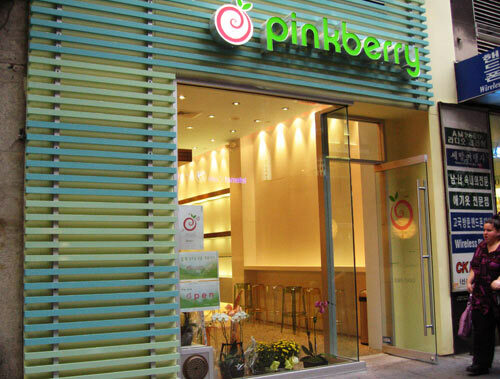 Do you want to go get some pinkberry? 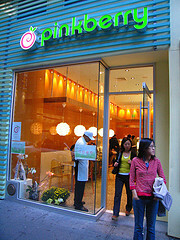 There’s a store in our neighbourhood that we’re pretty sure is a pinkberry, although I wasn’t convinced. So I got online last night to google it and see. I found this scathing review and I enjoyed it so much, I wanted to share it. Sooo… who wants to go get some fro-yo? P.S. It’s the taste that launched 1000 parking tickets! P.P.S. Ryan didn’t want me to post the scathing review until I’d actually HAD some pinkberry… but I’m starting to think that pinkberry might be putting the same thing in their yogurt that Tim Horton’s puts in their coffee! Can you say “double-double”?